VANCOUVER, B.C. - The Colorado Rapids came into Vancouver and crashed Whitecaps FC's Canada Day celebrations. The Rapids earned their first road win of the season with a surprise one-nil victory over Carl Robinson's squad. A first half own goal from Marcel de Jong was all that the visitors needed in front 21,038 fans at B.C. Place. MLS veteran shot-stopper, Tim Howard was in vintage form as he made 10 saves to earn his third clean sheet of the season. Colorado earned back to back victories for the first time this season. Anthony Hudson's side improve to 4-9-3 on the campaign. "I think we limited the defence for them to run in behind." Rapids centre-back, Axel Sjoberg, said post-match. "That's kind of their strength. We just defended well as a unit. We got bodies behind the ball, we all put our bodies on the line to help get the goal. Tim was great back there. Everyone really pitched in tonight." Howard was in the zone. Colorado gave up several prime scoring opportunities, but Vancouver lacked finish in the final third. Without Yordy Reyna (Suspension), Cristian Techera (Suspension), and Jose Aja (Suspension). Vancouver struggled offensively. Not only did Howard have to contend with Whitecaps FC, but fans behind his goal motivated him. Howard was also in a perfect spot for a pitch invader that had a run onto the pitch. The North Brunswick, New Jersey native, gave his take on both fan events. "Yeah the fans are crap." Howard said, of the jeers. "You know they've always got something to say. Look, I don't take anything lying down. Any chance I get to give them some stick back... when I walked off the field, they didn't have much to say. Unfortunately, they all went home. It's nice to give it back." "I've been around long enough to see some really bad incidents with fan violence towards players. I don't know how things work up here in Canada, in terms of police protection and all that. Security has been an issue in this league for a long time. Hopefully we can continue to crack down and get better and these things won't happen." Vancouver Whitecaps FC suffer back to back losses and fall to 6-7-5 on the season. "What we need to be better at, and it’s a recurring theme, is giving away bad goals." Coach Carl Robinson told reporters. "They had one chance in the first half from a misunderstanding and they scored a goal, whether it’s an own goal or not, and missed chances, we missed a number of chances today. I sensed it would come because they hung in the early stages. When you give a team the lead, as we’ve seen today, it’s very hard to break them down. We weren’t good enough." This was the most possession (71.6%) #VWFC have had in their @MLS history. Also the most successful passes (563) and total passes (641). They did just about everything but score. And yes, I know that's what matters. Colorado bunkered in with a defensive formation that at times had four defenders at the back. First year manager, Anthony Hudson was content with Vancouver maintaining possession, and Colorado holding firm with defensive shape. Whitecaps FC welcomed back captain Kendall Waston who was away with Costa Rica at the World Cup. Vancouver went 2-1-0 without Waston. The 'Towering Tico' made his only World Cup appearance count as he scored Costa Rica's first World Cup goal. "Kendall’s a big player for us, we know that." Robinson said. "He had a little bit of a stiff groin at halftime, I didn’t want to take any risks with him because he was holding it a little bit. I just thought at halftime we could make an adjustment by putting in an extra attacking player on. We had given them the one goal that they probably wanted and something to hang on to. We made the adjustment." The Caps had a quality opportunity to open the scoring in the 27' minute as MLS All-Star, Alphonso Davies found Nicolas Mezquida in front of goal. Playing up top as a striker, Mezquida belted an effort on target, only to have Howard make a point-blank save. Against the run of the play, it was Colorado and not Vancouver that got on the score-sheet first. Yannick Boli's attempt hit the bar, Joe Mason followed up on the rebound, and Rowe made a brilliant sprawling save. The ball deflected off Marcel de Jong, and past Rowe. Waston's return to the Vancouver lineup was short-lived as he exited the match with a groin strain. Jordon Mutch came on for Waston to start the second half. Brek Shea moved to left-back, and Marcel de Jong shifted over to centre-back next to Doneil Henry. Here's how we took the lead. Boli and Mason have great chances denied and it deflects off De Jong. We'll take it! Colorado came played a perfect road match, and for whatever reason... Whitecaps FC could not breakdown the Rapids defensively. 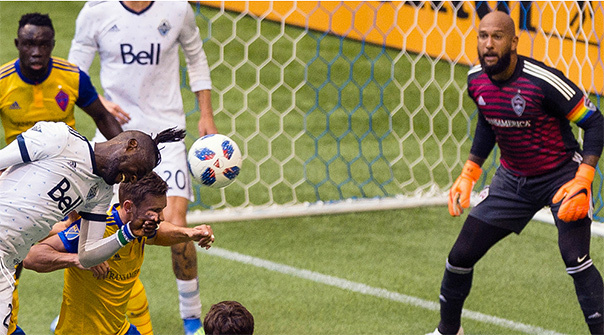 Tim Howard was a marvel in net, and the Rapids received a Canada Day gift from Marcel de Jong as they nicked three points. "It was massive for us obviously, after two results." Sjoberg said. "We needed to build on that, and get our first road win, so it was huge." Tim Howard turned back the clock against Vancouver. Colorado hasn't had the best season, but Howard always gives the Rapids a chance to win. He made several key saves throughout the match. He seemingly found a fountain of youth on Canada's 151st birthday. The Rapids did just enough in front of him to help shut the door on Vancouver, and steal a momentum on what was a massive match for both teams.